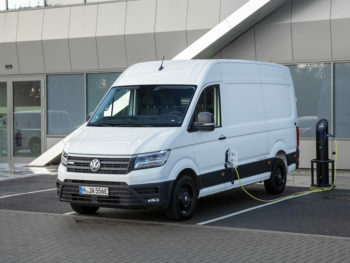 Van operators visiting the EV Experience Centre in Milton Keynes will be able to see the Volkswagen e-Crafter there this weekend (7-10 December) ahead of its arrival on UK fleets in mid-2021. Based in centre:mk at 26-28 Crown Walk, Milton Keynes, the EV Experience Centre provides impartial advice on going electric, including on electric and plug-in vehicles and by offering test drives, as well as giving charging and infrastructure advice. The e-Crafter will visit the centre following its debut the CV Show in Birmingham earlier this year. Four UK fleets have since tested the e-Crafter in real-world conditions, with the left-hand drive model now on sale in some left-hand drive European markets. UK pricing and specifications have yet to be confirmed but it is expected to be available in right-hand drive around mid-2021. The e-Crafter is aimed at urban operations with its 136hp, 290Nm torque output, official range of 107 miles and top speed limited to 56mph. A lithium-ion battery is completely integrated into the underbody, meaning the standard vehicle’s entire cargo volume (10.7 m3) is fully usable. A maximum payload of between 1.0 and 1.75 tonnes is available.